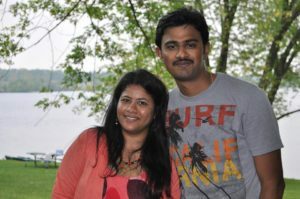 The widow of the Indian American engineer Srinivas Kuchibhotla, who was murdered in a Kansas bar, last February, is featured in a television ad for Kansas Rep. Kevin Yoder. In the 30-second ad, Sunayana Dumala praises Yoder for helping her stay in the U.S. after her husband’s death, after which she lost her visa, which Yoder helped her get back, according to an AJC report. Yoder is a four-term congressman, who is running a tough race against Democrat Sharice Davids. Yoder had been fully endorsed by President Donald Trump in July after the GOP unveiled a plan that included building a wall along the U.S-Mexico border. However, Yoder decided not to attend the President’s recent rally that was held in his neighboring district in Kansas and instead, released the ad three days later. The ad highlights how immigration is a tricky issue in the Kansas City-area 3rd District, where Trump narrowly lost. According to an AJC report, Bob Beatty, a Washburn University of Topeka political scientist, said that many anti-Trump voters claim that the president in an “anti-immigrant” person and that the ad allows Yoder to “put some distance” between them. Yoder is also working on legislation aimed at clearing a backlog in the processing of work visas, even though he has faced some criticism for his pro-immigration attitude.